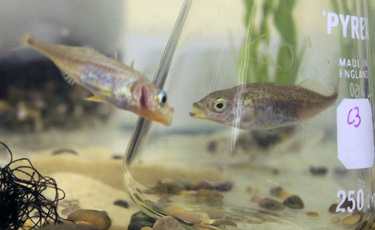 Studies of three-spined sticklebacks showed that environmentally-induced alterations in the early growth pattern led to a reduction in reproductive performance later in life. Photo by W. S. Lee. Food supply and environmental conditions affect the growth rates of organisms, which in turn influence future survival and reproduction. A new study by researchers at the University of California, Santa Cruz, and the University of Glasgow shows how mathematical models can be used to characterize and quantify these effects. "Over the last fifteen years, we have recognized that events early in the life of organisms, including people, can have great consequences for health in later life," said Marc Mangel, distinguished professor of applied mathematics and statistics in the Baskin School of Engineering at UCSC and senior author of the study, published in the journal American Naturalist. The paper describes complex patterns of feeding, growth rates, and reproductive success in fish. First author Who-Seung Lee worked on the study as an associate specialist at UC Santa Cruz and a graduate student at the University of Glasgow. He is currently a postdoctoral researcher at the University of Quebec in Montreal. The researchers investigated the optimal rates of growth under different environmental conditions for fish and other "cold-blooded" animals (known as ectotherms). In these animals, growth is sensitive to ambient temperature even when food is not limiting. Compensatory growth can make up for a period of slow growth early in life, resulting in normal adult size, but the costs of an accelerated growth rate can reduce fitness. Costs may include increased exposure to predators due to more active foraging behavior, as well as increased accumulation of biomolecular damage during periods of higher metabolic rates. "One expected consequence of climate change is that fish will experience growth conditions quite different from the ones in which they evolved. Our work suggests that even if it appears that a fish has 'caught up' when a period of poor growth is followed by one of good growth, there may be unforeseen consequences for its survival and reproduction, and our work provides a framework for assessing these consequences," said Mangel, who directs the Center for Stock Assessment Research (CSTAR), a collaboration between UCSC and NOAA Fisheries Service labs. The researchers developed a range of life-history models of increasing complexity, with different scenarios for the trade-offs between early growth rate and accumulation of damage. They compared the predictions of the models with experimental results from three-spined sticklebacks induced by temperature manipulations to follow three different growth trajectories. The results showed that environmentally-induced alterations in the early growth pattern lead to a reduction in reproductive performance later in life. These reproductive effects appear to result from changes in the rate of accumulation of physiological damage. The models and experiments also showed "negative compensatory growth" after an earlier period of higher temperature, with growth rates suppressed in comparison with animals that had been at a constant temperature. The decelerated growth had a positive effect, with both models and data showing that fish undergoing rapid growth early in life but suppressed growth in the lead-up to the breeding season would perform better than those growing steadily throughout their juvenile life. This study shows that, despite the clear costs of impaired development in early life, life-history strategies can reduce these negative effects so as to maximize expected reproductive success. Thus, animal growth trajectories may take account of the long-term consequences of different growth rates, as well as the current ecological conditions. This research was supported in part by the U.S. National Science Foundation. Lee's work with Mangel at UC Santa Cruz was funded by the University of Glasgow's Jim Gatheral Scholarship and a grant from the Glasgow Natural History Society.